Never a winner as an amateur, McGeady closed with a 68 at the Vale Hotel Golf and Spa Resort in Cardiff to finish on four under par. Overnight leader Joel Sjoholm of Sweden matched him thanks to a birdie at the 17th but it was the Irish ace who triumphed thanks to a par at the second tie hole. The winner’s cheque for €22,400 catapulted McGready 125 places up the Challenge Tour Rankings to 34th place and with the top 20 progressing to the main tour, he's ready to push on in this week's Challenge of Ireland at Glasson. McGeady said: “This win’s massive for me – I’m absolutely delighted. Those four birdies in five holes on the back nine really got my round going, and from there on in I just tried to play steady golf because I knew four under would have a chance – and so it proved. “It’s a big relief for me, because my category didn’t guarantee me entry into every event. But now I’m fully exempt for the rest of the year, which means I can pick and choose the tournaments I play in. So it’s really set up my season. Ulsterman Gareth Maybin finished a shot outside the play-off in a share of second place on three under after a 69. Big Mick McGeady ditched his eternal bridesmaid’s tag when he grabbed his first pro win in Wales. Gareth Shaw is inspired by former rival Rory McIlroy in his quest to blaze a trail to tour glory. But the Lisburn native, 23, is prepared to earn his stripes on the Challenge Tour before he joins Ulstermen like McIlroy, Graeme McDowell, Michael Hoey, Gareth Maybin and Jonny Caldwell in the big leagues. 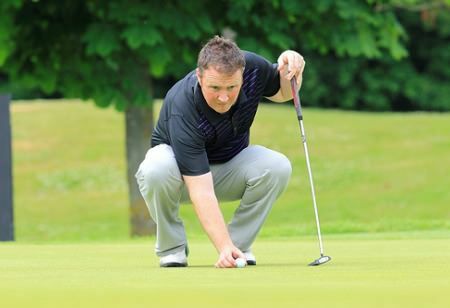 Michael McGeady is playing well and close to what could be a crucial win on the Europro Tour. Picture © PGA EuroProTour.comMick McGeady might have closed with a 74 but the big Derry man lodged another cheque in the bank in The Buildbase Open on the PGA Europro Tour and then put his Open Championship qualifying disappointment behind him.